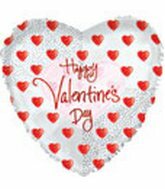 We offer a wide selection of Valentines balloons at discount prices. 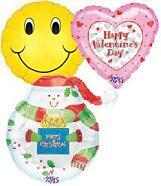 Save 20-60% on your valentines day party balloon needs. 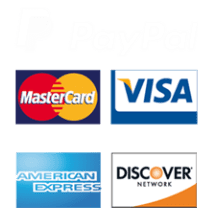 We now accept School Purchase Orders through the online checkout. Do you want to spend less time online? New high speed internet catalog version? Press the link below to check out our new foil party balloon catalog version which includes a wide selection of valentines day balloons. In less than 10 pages you can see our entire catalog. 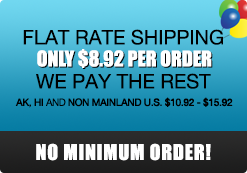 This will save you time when placing an order. For most other businesses Christmas is the busiest holiday of the year, but for most balloons stores and florists Valentine's day is the busiest balloon holiday of the year. Valentine's Day is celebrated in the United States and Canada, but also in other countries such as Mexico, the United Kingdom, France and Australia. The first valentine's greetings were popular in the middle ages, however chances are good that they were not giving out Valentines balloons. Valentine's has grown in popularity ever since. 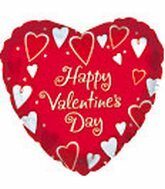 The most popular valentine's gifts are valentine's day cards, flowers, chocolates and valentine balloons. 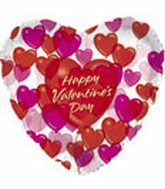 Valentine's Day balloons are available in various designs including foil valentines balloons in various shapes and sizes with hearts being the most popular shape and red, white and pink being the most common valentines balloons colors. Latex Valentines balloons are also available in different prints. Be sure to also stock up on love balloons since they will sell quickly as well. 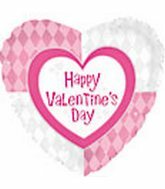 We are your source for mylar valentines balloons, latex valentines balloons and other valentines balloons accessories. We look forward to shipping you your first valentine balloon order. Want to e-mail us. Please email us at any questions, comments and/or special requests. E-mails are answered throughout the day including weekends and holidays.